The simple fact is that our health is largely invisible. We can’t see our blood pressure, we can’t see a virus as it multiplies and takes over our cells. We can’t see our cholesterol, hematocrit level, or the deterioration happening deep within our joints. We can’t watch as the refined sugar we pour into our bodies causes a spike in insulin, leads to inflammation, and sets the stage for so many diseases. We can’t see our lungs blackening from cigarette smoke. We can’t see our genes and how they program our cells to behave. You get the point. The problem with all this invisibility is that we humans seem to be really bad at taking action based on abstract things. Especially health decisions. James Prochaska’s Transtheoretical Model for health behavior change outlines the process a person goes through before committing to a new healthy habit – and it all depends on a person’s ability to picture their future self. Case in point: The CDC reports that more than 26 million Americans who are eligible for cholesterol treatment (meaning they have high cholesterol), do absolutely nothing about it. No medication. No dieting. Nothing. It’s not until something becomes a real problem that we can see and feel – like a heart attack – that we take action. And by then, it’s unfortunately too late. On the flip side, if we can actually see the problem, we seem to take action right away. When there are occasional reports of shark sightings on the news you still see people swimming at the beach. But as soon as someone spots a dorsal fin and yells, “shark! !”, people are out of the water and back on dry land in world-record time. The sharks were there all along, they just weren’t visible. An extreme example, but I believe the same analogy holds true for healthcare. Imagine trying to convince someone who eats deep fried food every day to stop eating it because of the damage they are doing to their heart. Chances are, it would be a pretty frustrating conversation. Now, imagine you could make the invisible visible. Show them what’s happening in their own body as those fries get turned into a waxy substance that gets deposited into their arteries, making it a tighter squeeze for blood to reach their heart, and a struggle for the heart to circulate blood to the rest of the body. Our brains are wired to process visuals. In fact, pictures are more deeply encoded to memory and easier to recall than words. So the next time that person sees a greasy french fry, you can bet they’ll look at it in a new way – and be less likely to put it into their mouth. That kind of persuasion is far more effective than getting yet another lecture from a doctor or a spouse about the importance of healthy eating. The good news is there’s a lot healthcare providers can do right now to start making the invisible visible across much of healthcare. Start with the typical cholesterol lab report. Today, it’s nothing more than a bunch of acronyms and numbers. It is a far cry from looking at a visual depiction of that clogged artery. 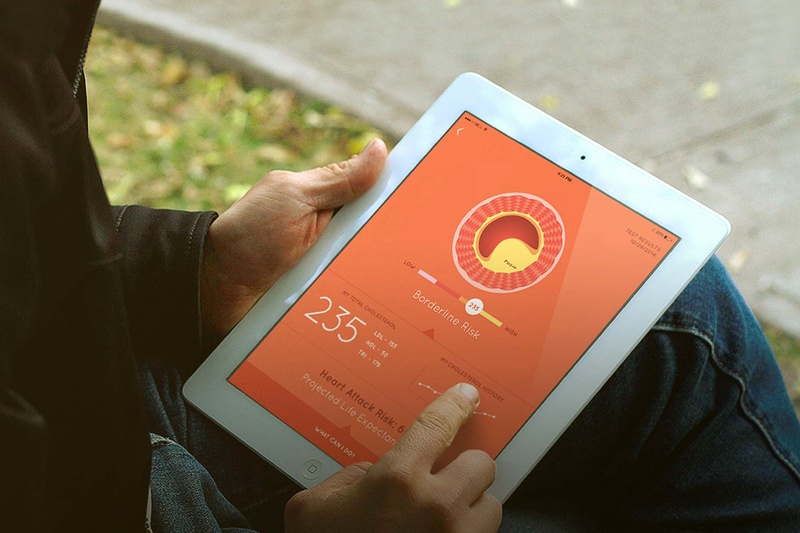 But what if a lab report could show you a cross section of what your artery might look like? What if it could show you how things would change if you make a small positive or negative change? How might that motivate you to make some changes? Suddenly, your health would be more tangible and you’d be more connected to it. Invisibility is rampant in healthcare. A good example is quality data. In other industries consumers know how to evaluate quality. If Consumer Reports gives me a simple chart that tells me which washing machine lasts longer, I should be able to figure out that one hospital has a much higher survival rate for a particular procedure than another. Our own research shows that consumers don’t understand that quality of care differs from one hospital to the next, nor do they understand how to go about evaluating it. If I’m getting a liver transplant, I should easily be able to see what the wait time for a new liver is for that particular hospital. But it’s not easily visible. Ironically, medical imaging hasn’t really improved visibility. For most people, an image such as an X-ray or MRI is very hard to grasp. What’s clearly a rapidly deteriorating joint to a hip surgeon usually looks like a Rorschach test to a patient. Now imagine having that same consult but instead of looking at a primitive x-ray you’re viewing your hip in 3D virtual reality along with your surgeon. You spin it around and view it from any angle. The surgeon toggles between your actual hip and one that’s in perfect condition so you clearly see the difference. You see where the cartilage is gone and bones are grinding together. Now he shows you how your hip will look when it’s fixed. After the surgery, imagine seeing an instant replay of sorts, complete with a voice over from your doctor explaining exactly what was found during surgery and how it went. Instead of just a scar you have a movie. Imagine the same scenario when looking at a tumor. Using data that’s already captured today, you can show a patient what’s happening in their body in realistic 3D graphics. Ultimately, making it much easier to understand – which gets them more involved in their care. Involving patients in their care in this way isn’t just good for them, it’s also good for the hospital. Neuroscience shows that a shared understanding between two people builds trust. When patients trust their doctors we see greater adherence to treatment, not to mention a far more enjoyable customer experience. Uber understands that wait times can be frustrating for consumers. That’s why it shows you exactly where your car is and how long you have to wait. 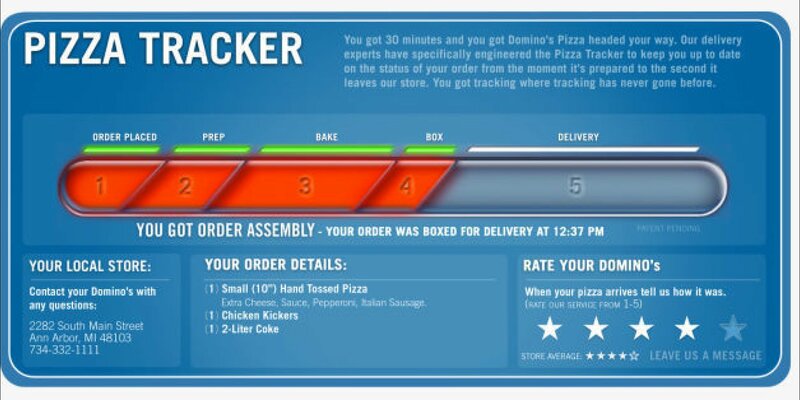 Dominos has a Pizza Tracker that shows you exactly what stage your pizza is at. In this case, visibility makes for greater patience – and customer satisfaction. Many healthcare providers are beginning to address this by communicating wait times to patients on their websites or on a screen in their practice. There’s nothing more frustrating than sitting in a waiting room with no idea how long you’ll be there. By communicating and appropriately setting patient expectations, hospitals are seeing measurable gains in patient satisfaction. There are small steps that can be taken to increase visibility. Here’s just one: I recently received instructions for a medical procedure. It was pages and pages of pure text that was hard to make sense of. Why not turn it into an engaging infographic? People are wired for visuals. Imagine the gains people would make in their own health and the cost savings for the healthcare system if our health care were simply more visible? What if even a fraction of those 26 million Americans not doing anything about their high cholesterol started living healthier? Visibility would likely lead to better outcomes than almost any new drug. While visibility has become expected in so many other industries, no industry could benefit from it more than healthcare. It’s time to redraw what healthcare looks like in the rest of the 21st century.